Beaumaris is a pretty little town on the Isle of Anglesey. 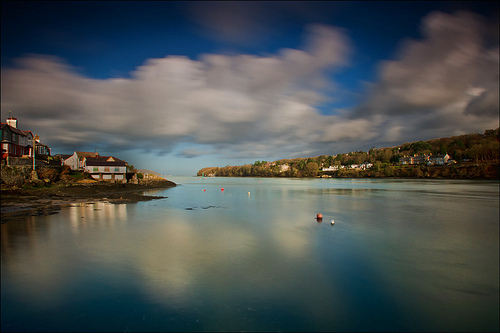 To reach Beaumaris, you cross the Menai Strait, a tidal stretch of water separating Anglesey from the mainland. The town has a long and interesting history, dating back to 1295 when Edward I commissioned Beaumaris Castle. The name Beaumaris means ‘beautiful marshes’, which indicates that the original settlement was built on a marsh. Beaumaris was originally the main commercial centre on the island and a major port, but these days the port is mainly populated with yachts, and tourism is one of the main sources of revenue. If you come to Beaumaris for the day, the first thing you will see when you arrive from Menai Bridge is the pretty row of colourful houses to the left of the marina. The main street of Beaumaris is populated with small shops, cafes, and restaurants. The main car park is at the far end of the town, adjacent to the castle and pier. In the summer, Beaumaris can get very busy, so it is better to arrive early if you want to park without difficulty. There are lots of fun things to see and do in Beaumaris. There is no beach as such, but the town has a long pier where children can sit on the side, and dangle string and bait into the water to catch crabs. There are lots of little shops worth exploring. Many are situated along the main high street, but be sure to have a wander down the back streets, too. And, if you enjoy art, take the time to check out the work of local artists in one of the town’s art galleries. Taking a boat ride from Beaumaris Pier is a popular day out for visitors. Puffin Island is not too far away. If you want to catch a glimpse of the local wildlife, including seals and puffins, book a seat on one of the boat trips that depart daily. There are also several fish and chips restaurants and takeaways in Beaumaris, so why not buy some and then sit on the pier watching the yachts sail down the Menai Straits. Beaumaris Castle, a World Heritage inscribed site, is the principle attraction of this thriving little town. The castle is one of several magnificent castles built by Edward I in his attempt to keep control of the Welsh. Sadly the castle was never finished, but despite this, it is a fascinating place to visit and with a bit of imagination you should be able to picture what life was like many hundreds of years ago. Other interesting places to visit in the town include the Bulls Head Inn, which was built in 1472 and is notable for being the headquarters of General Thomas Mytton during the ‘Siege of Beaumaris’ in 1648. The Tudor Rose is another important historical landmark – it is notable for being one of the oldest timber-framed buildings in Britain. There is also the courthouse, which was built in 1614, and St Mary’s Church, a 14th century parish church.